Arsenal progressed through to the final of the Carabao Cup after defeating London rivals Chelsea 2-1, but it was a decisive switch in formation by Arsene Wenger at half-time that proved pivotal to changing the fortunes of the Gunners. The Frenchman is often characterised as being too intransigent for his own good, which the lack of structure in his team’s attacking positioning and seemingly ad-hoc approach to dealing with Eden Hazard in the false nine position reinforced. Nacho Monreal’s deflected header to make the scores level at the break was not a true reflection of just how dominant – and easy dominance to achieve at that – Antonio Conte’s side were. 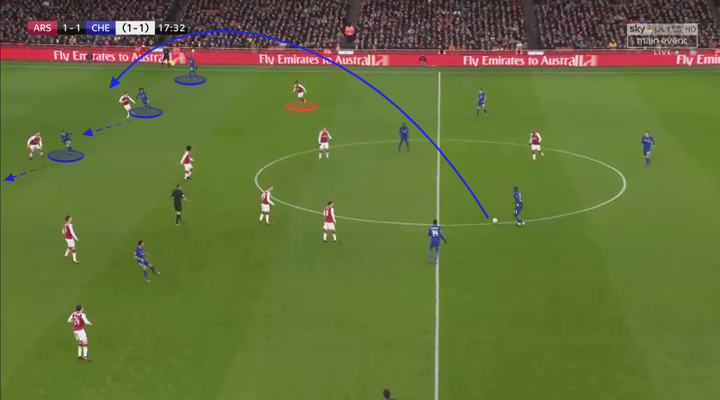 Arsenal set-up in a 4-1-4-1 formation when Chelsea were building from deep, with Mohamed Elneny screening passes into the central area where Hazard was roaming. As the first-half progressed Cesar Azpilicueta began to edge forward into a more traditional right-back role such was the space Chelsea were allowed to drive into. Alex Iwobi was tasked with tracking Victor Moses all the way through the thirds, which limited him to almost an identical wing-back role, but Mesut Ozil’s slot in the system was less distinguishable. Hazard’s opening goal was a prime example of how undercooked Arsenal’s defensive strategy was, and progressed as follows. As Azpilicueta travelled forward Granit Xhaka eventually felt compelled to vacate his position and press alone leaving a simple pass into Ngolo Kante who could pivot and turn into acres of space like he did numerous times. Elneny was concerned with Hazard dropping into deeper pockets of space to pick up the ball and so wasn’t prepared to press in support of his Swiss teammate. There was little cohesion between his partner Jack Wilshere, though, as he stuck to containing Chelsea, which opened the gap. The move, whilst coming in the seventh minute, was a microcosm of Arsenal’s failings in the first-half. The defence were being forced to defend in a high line but the porous midfield meant that the lack of pressure on the ball made it even more difficult as Pedro and Willian augmented the threat of Hazard by playing close to the Belgian. Shkodran Mustafi really struggled to get to grips with the fluidity of the front three’s movement. He was regularly attracted to players operating between himself and Elneny, which gave Hazard ample room to thrive in. As the ball was played to Pedro, Koscielny had to decide whether to drop and delay the pass to Hazard or gamble by confronting Pedro and blocking the pass, but he was caught in two minds and never shifted across enough to tighten the angle for the pass. Ozil adapted his position throughout, and occasionally joined Lacazette in a two but neither split themselves between Chelsea’s back three in a sufficient manner to stop Andreas Christiensen from driving out of defence. 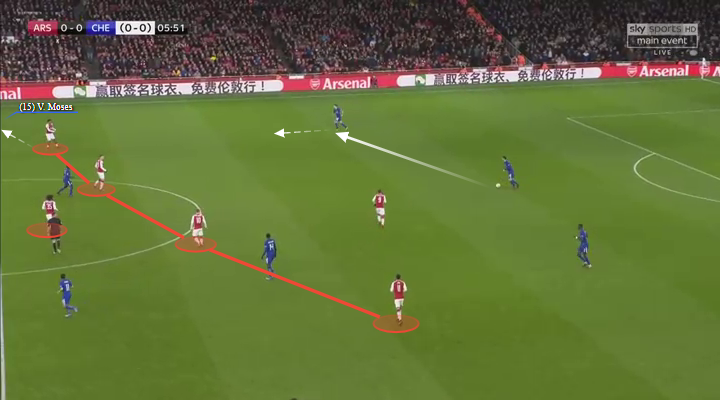 This passive approach put strain on Arsenal’s midfield who were inconsistent in deciding whether to disconnect from their shape or to maintain and cover the space into Hazard’s feet. Elneny’s deep-lying position did little to patrol the area in front of the defence, which was repeatedly left vulnerable as man-for-man situations continued to arise. Ross Barkley’s introduction on the left wing as a replacement for Willian saw him drift into central areas even more than his Brazilian teammate. He and Pedro presented a problem for Elneny and the two centre-backs as the lack of pressure on the ball, combined with willing runners in behind, created a dilemma as to whether they should risk pushing up to play offside or deepen but, in turn, increase the lines between the midfield. Kante continued to be afforded room to dart forward from deep, even when Iwobi changed tack by tucking inside and allowing Moses to push on himself. The Arsenal midfield’s focus on denying the early ball into the final third meant they dropped off but Lacazette wasn’t deployed to deny the ball into Kante, which led to a continuous stream of pressure as he entered the Arsenal half. Hazard is clearly the talisman of the side but he was like a magnet for the Arsenal defenders, which created glaring imbalances in the defence as they overcompensated for his threat. Here, Hazard’s intricate footwork and awareness of how to navigate a way out of tight areas, eliminates three players who were drawn to him. The gap between the two deepest defenders here would have been a frightening image for Wenger, and had Chelsea exploited these situations more efficiently the game could have been out of reach for the Gunners. Iwobi may have been responsible for following Moses to the bye-line but his concentration lapsed in a few instances, which offered the switch of play to the wing-back, as the movements from out-to-in dragged, in particular, Monreal, inside. Arsenal were penned in during the opening stages of the game and conceded possession by trying to play out several times. The problems in transitioning when in space came from poor pass selection but the difficulty in playing out from deep positions came from the lack of an out ball due to how deep Arsenal’s defensive positioning was. The club’s mantra meant that they tried to persevere with passing it out, but it was often self-inflicting as the image below shows how there was no outlet due to how deep Lacazette was. Arsenal’s fluidity going forward was easily shackled by Chelsea, who had two flat banks of five and four to prevent the home side from getting into central areas where they could showcase their combination play. The compact shape was so that they were happy to allow the ball wide to Iwobi and shuffle across thereafter. Arsenal were not comfortable with having to play around the sides of the block, and Iwobi didn’t take advantage of the space he was granted, choosing to come infield rather than taking on Moses. The lack of passing options in the areas between Chelsea’s back five and midfield made it difficult to exploit their high line as possession was so often circulated from one side to the other with Arsenal’s centre-halves spending most time on the ball. Ozil became so frustrated that he had to drop into full-back positions to try and influence the game as there was no service to speak of. Arsenal resorted to playing the ball over the top to Lacazette in order to test Chelsea’s unerringly high line but the French forward’s failure to time his runs meant that he was caught offside far too regularly, save for this example below when he peeled off Christiensen. Arsenal were able to get controlled possession from the off after switching to a back three by dropping Elneny alongside Koscielny and Mustafi. Bellerin’s more advanced position drew out Alonso from the previously flat line of five and created a gap to play a quick pass into the final third. While Elneny was a traditional centre-half when defending, he pushed up into a deep midfield position when in possession to receive behind Hazard. Hazard wasn’t able to torment the Arsenal defence in the second half, as they simplified their marking structure by having the Egyptian man mark Hazard when he was in central areas. In the opening 45, Arsenal were guilty of leaving huge horizontal spaces in the last line of defence but the structure of both wing-backs tracking their counterparts with all three centre-backs man marking made it simpler to guard against Hazard taking up awkward positions in front of the defence. When Conte rolled the dice and introduced Michy Batshuayi, it naturally made the game more open as Hazard became – purposely – detached from the shape and left space for Arsenal to receive down the left side.